Funerals are always hard, as it’s difficult to say goodbye to someone that you loved. The memorial service does play an important role in the grieving process, though, giving you the chance to say goodbye and honor your loved one. When you’re grieving, planning a funeral is the last thing you want to think about but carefully putting together a beautiful service for your departed loved one can help you to heal. Still, you don’t want any added stress when you’re putting together the details of the service, which is why our funeral program template downloads are so ideal. Funeral programs are the pamphlets that you distribute before a funeral or memorial service. The funeral program usually includes the order of service that allows attendees to follow along and know what’s coming next throughout the funeral. A funeral service program can also include a copy of the scriptures, poetry and quotes that are uplifting and photographs and memories of the deceased. Many people also include a copy of the obituary in the memorial service program. 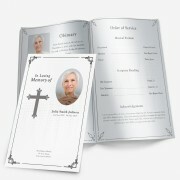 It’s very easy to create funeral programs with one of our funeral program template downloads. We offer funeral program templates for Microsoft Word that you can edit quickly and easily. If you don’t already have the program installed on your computer, you can access a free trial version to use to customize your funeral program for Word document. At Funeral Pamphlets, we have a wide array of funeral service program downloads available. 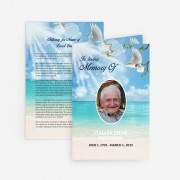 You can choose to create small funeral cards that print four to a page or simple single fold memorial service programs. To include more information in your funeral programs, our gate-fold, tri-fold, two-page graduated and four-page graduated memorial service program downloads are ideal. With downloadable funeral programs available in an array of styles and themes, Funeral Pamphlets has something that is ideal for anyone’s memorial service. We have funeral program templates that can be used to celebrate the lives of men and women of all ages and youth programs that can provide comfort when a child dies. All of our memorial service program templates can create beautiful keepsakes that attendees can save and treasure long after the service has come to an end. 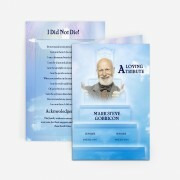 You can shop for funeral program template downloads by type or simply browse our entire collection to see all of the options that are available. Once you have found the funeral program for Word that you prefer, you can complete your order and gain instant access to the download. Customizing is quick and easy, and we’re available to answer your questions and help with anything that you need. We even offer a customization service and will gladly add the text and photos that you desire to the memorial service program of your choosing. With funeral programs from Funeral Pamphlets, you can pay tribute to your loved one in a special way and save money by designing and printing your own programs. Explore our collection of funeral program downloads now and please don’t hesitate to contact us if we can assist you in any way.